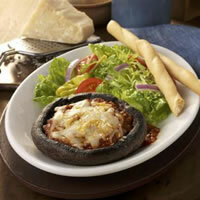 With hearty portabella mushrooms topped with melted mozzarella, this quick and flavorful dish will satisfy even die-hard of meat eaters. Heat oven to broil, with top rack about 4" from broiler. Brush both sides of mushrooms with oil. Place mushrooms, gill side down, in a 9 inch baking dish. Broil for 4 minutes, remove and turn gill side up, broil 4 minutes. Remove mushrooms from baking dish, drain excess liquid. Reduce oven to 400° F.
Spread 1/2 cup pasta sauce on bottom of baking dish, then place mushrooms, gill side up. Sprinkle with basil, red pepper flakes and the remainder of the pasta sauce. Top with mozzarella cheese and parmesan; bake 5-10 minutes, until the cheese begins to brown. Remove and serve.